Bonaire and Curacao are part of the ABC islands nestled in the Southern Caribbean. The A being for Aruba. As these three islands are so close, you would think that cruise ships would automatically have both on any itinerary, but this is not the case. Cruises to Bonaire are not that plentiful, with only a handful of ships choosing it as a port of call. Curacao and Aruba on the other hand are inundated with cruise ships on a regular basis. Cruises to Aruba from Florida include many that also stop in Curacao, but not Bonaire like the offering from Carnival that departs Ft. Lauderdale. 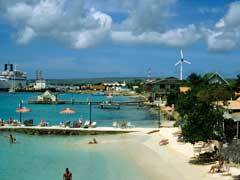 Princess’ 10-night roundtrip from Ft. Lauderdale includes Aruba and Bonaire, but not Curacao. Carnival, Norwegian and Oceania all offer cruises from Miami that will stop in Aruba and Curacao as well. Bonaire is known for its wildlife and diving opportunities, it does not cater specifically to the cruise ship tourist who is looking for adventure and high flying excursions, which could be why only some cruises include it. However if you are looking for a place that was eco-friendly long before it was cool to be so, then Bonaire is the place to be. Cruises to Bonaire that also include Curacao include the Royal Caribbean cruise deals that include Colon, Cartagena, Aruba and Panama that starts at $638pp. Holland America visits both islands as do Celebrity as part of their 14-day excursion around the Southern Caribbean. Cruises to Bonaire can be had on smaller charter vessels from Curacao as part of a shore excursion. Since the two islands are only 30 miles apart, many sailboats make this trip on a regular basis, which is great for the dive or nature enthusiast. Southern Caribbean cruises that stop in both Curacao and Bonaire give you the experience of both island extremes. Though both are ruled by the Netherlands, Bonaire is a quieter destination, a diver’s paradise and they established the first marine park in 1979, there are no casinos or crazy nightlife to be had, but also no rainy season. Curacao on the other hand is full of pastel coloured houses, is always warm with trade winds and offers more diverse things to do for the cruise ship passenger. Caribbean cruise deals will allow you to explore the Southern Caribbean, whether you pick Curacao or cruises to Bonaire in your itinerary. Remember to book early so you are not disappointed!